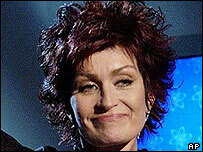 Sharon Osbourne has said she briefly left husband Ozzy this year over his use of alcohol and prescription drugs. She said the couple separated in the spring around the time their teenage son, Jack, went into a rehabilitation programme. Osbourne told TV interviewer Barbara Walters her husband had continued to abuse himself while the family waited for a bed to become available for Jack. The separation lasted for a few days, the 50-year-old said. "I just said, 'you just have to stop', and he didn't," Osbourne told ABC's 20/20 programme, which is airing in the US on Friday evening. "And I said, well then, I'm going'. And I packed my bags, and I left." She added: "The minute I left, the next morning, he gave up drinking. But I needed to make sure that he was on a roll. That he really meant it. "And, after four days, I came back to see him. And he was trying so hard. So hard. Still is clean and sober." Jack Osbourne, who spent two months in rehabilitation for alcohol and drug abuse, acknowledged that he tried to commit suicide because he was so depressed about his mother's colon cancer, which is now in remission. "I attempted to overdose," said the 17-year-old, who gained fame with the rest of his family on the MTV series The Osbournes. "Take a whole bunch of pills and drink some absinthe."